I am lured in by a chalkboard in front of a wine shop: Every additional glass of wine is five quetzales cheaper than the last. Tabacos y Vinos does not have an English name, sure, but it is a quintessential gringo hangout in a town full of gringo hangouts. I meet a retired archeologist (now expat), a schoolteacher from New England, a group of law students doing a two-week program, a group of guys from Arkansas in seminary school learning Spanish, and the lady working that night. There is a local on duty in case someone comes in and needs to speak Spanish. It is less a bar than wine shop in setup, with a large square table surrounded by wine bottles shelved on the walls, so it is hard not to talk to people while hanging out there. Antigua has a ridiculous amount of language schools and lures droves of English speakers to learn Spanish the best way: cultural immersion. The only problem is that finding someone willing to speak Spanish to you is harder to come by than someone willing, or able, to speak English. One could hang out on the outskirts of town, away from the bright lights of the city center. One’s language skills can be tested as they plead with a thief not to steal all of their things. Maybe you just need to be put into danger to bring your language skills up another notch. The fact is, Antigua is lovely and also very tourist friendly. 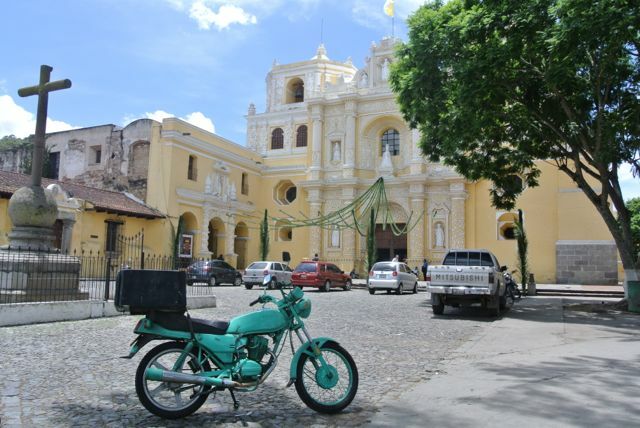 It is very popular among gringos because many people here speak English, the Spanish Colonial architecture is quaint, and it almost feels like home. It is more expensive than other parts of Guatemala, but there are still many cultural and natural attractions very close by. On a guided bike tour through surrounding villages, Valhalla Macadamia farm offers a tour of their eco-friendly, solar-powered operation. With As Green As It Gets, one can take a tour of a coffee farm with the farmer and enjoy some fresh roasted coffee the old school way. That is, roasted on a clay plate called a comal over a wood fire and then ground with a large rock. Notes of wood tantalize your palate. As Green As It Gets is headquartered in San Miguel Escobar, which was once the capital of Guatemala before Agua Volcano destroyed it and the capital was moved to Antigua. A subsequent earthquake leveled Antigua, hence the modern capital in Guatemala City. My previous month in Mexico, it seemed people would only speak in English if completely necessary, with a look of chagrin. In Antigua, one can enjoy drink specials at bars for ‘Ladies Night’ and not have to speak Spanish at all. After five glasses of wine descending in price, I excuse myself and head somewhere else. Somewhere to escape this strange gringo takeover. At Café No Se I am greeted in English at the bar, where I order a cheap beer. So much for authentic experiences. They also have a mezcal bar, where they serve Ilegal Mezcal. It is very much the setup of a bar you might see in one of the big cities in the states. Pizza is served until midnight. But for all my qualms about authenticity, I like this bar and return to it both with people and alone to have a beer at the bar. It is not un-authentic to be a traveler’s bar. In the end, I’m not sure what to say about Antigua. It’s a nice place to hang out, there are many things to do in the surrounding areas, and it’s safe. Standing near a Subway Sandwiches store I hear over and over, “Let’s just go to Subway.” Please, don’t. At least get a torta at one of the many local restaurants. You don’t have to step out of your comfort zone here, but you can, and it is often much more rewarding. Simply a visit to some surrounding villages might do the trick. This entry was posted on June 18, 2013 by alexjparton. It was filed under Americas, Guatemala, Travel and was tagged with Antigua, bars, coffee, gringos, Guatemala, learn spanish, macadamia, mezcal.